"Passed down from my grandparents, this recipe is a great way to use the extra tomato and peppers from the garden! Quick, easy and also very healthy! A nice warm lunch for the veggie lover! Makes its own sauce and can be canned for the winter months. Serve over sliced fresh buttered bread and a few shakes of salt and pepper." Bring a pot of water to a boil. Carefully add the tomatoes to the water, and boil until the skin begins to split. Remove from the water, cool under cold running water, and peel off the skin. Place tomatoes into a large skillet, and mash with a potato masher. Mix in the bell peppers, onion and garlic. Simmer over low heat for about 20 minutes, or until onions and peppers are tender. Season with salt and pepper to taste. 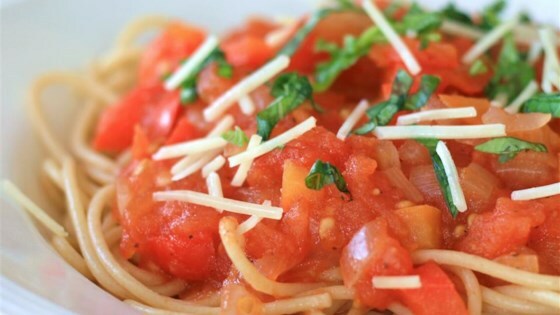 See how Chef John makes his delicious, all-purpose tomato sauce. This was great - it tasted so fresh. I didn't have an onion, so I just used some onion powder. I also added some basil, parsley, and rosemary from my yard. I used this as a base for all my end of season tomatoes and sweet peppers of several varieties. Easy to do. Makes a tasty basic sauce that can be adapted with spices to many uses.